Skimming is a water purification technology that is used in many reef aquaria. It goes by a variety of different names including foam fractionation, protein skimming and, most frequently, just skimming. Likewise, the device itself is referred to as a skimmer, a protein skimmer or a foam fractionator. Its basic purpose is to export dissolved and particulate organic matter from the aquarium, with the substantial side benefit of increased aeration. Such devices have been used in other industries, such as protein purification, for many years, and many hundreds of scientific papers discuss their use. This article is intended to help aquarists understand how skimmers work on a molecular level. Because skimmers vary considerably in design and represent a continually evolving technology, this article will not attempt to show that one design is best. In a 2002 article Frank Marini detailed many of the designs available at the time and discussed some of the design principles for making skimmers. In addition, this article's reference section provides additional scientific references for those who are interested in some of the engineering aspects of skimmers designed for use in seawater. Instead of repeating the type of information mentioned above, this article will focus in a more detailed fashion on the physical principles behind skimming. It also will help aquarists understand what is and is not removed by skimming and whether any special supplements are needed when skimming. For those undecided on whether to use a skimmer, it may help aquarists decide whether to use the technology and, if so, how aggressively to do so. How Much Absorbs at the Interface? What Collects at Air/Water Interfaces, and Why? Why does skimming work better in saltwater than in freshwater? What organics are not removed? Organic compounds are generally defined by chemists as those that contain carbon and hydrogen atoms, but can contain other atoms as well.They often contain nitrogen and phosphorus so skimming and the export of organics tends to have the very useful attribute of exporting these molecules before they can be broken down into nitrate and phosphate. Many organisms, from fish and people to bacteria, for example, take in organic materials as a source of energy and release the excess nitrogen and phosphorus not needed for growth. In many cases in an aquarium these excreted materials end up as nitrate and phosphate, either by direct excretion, as in the case of phosphate and nitrate, or as ammonia, urea, or other nitrogen-containing compounds that through additional bacterial processing can end up as nitrate. Many metals, such as copper, are tightly bound to organic materials in seawater. If these metallo-organic compounds are skimmed out, it can be beneficial if the metals are present at undesirably high concentration (such as after an accidental exposure to copper), or it can be undesirable (such as when the metals have fallen to growth-limiting concentrations). The term "organic compounds" includes everything from sugars, starches, proteins, DNA and fats, to gasoline, automobile tires, Corian© countertops, super glue, computer keyboards and acrylic aquaria. Most important to reef aquarists are those detrimental organic compounds that tend to accumulate in aquaria, or that are otherwise a significant concern. 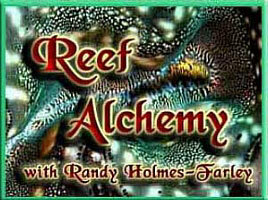 Toxins released by corals and other organisms, for example, are organic compounds. So are most of the compounds that eventually yellow the water in a closed system unless steps are taken to remove them. Many of these can be removed by skimming. Consequently, substantial benefits can be gained by exporting organic materials, and skimming is one of the best ways to do so (other good ways include using activated carbon and ozone). Before getting into the details of skimmer function, it is useful to know some important chemical definitions. Molecules, such as the organic molecules found in seawater, are often described as being either hydrophobic or hydrophilic. Hydrophobic means "water fearing" (hydro meaning water, phobic meaning fearful). Likewise, hydrophilic means "water loving." Examples of hydrophobic molecules are methane (natural gas), oil, fat, cholesterol, most of the molecules in gasoline (e.g., hexane), lighter fluid (butane), some vitamins (e.g., A, D, E, K) and many refrigerants (e.g., chlorinated fluorocarbons (CFCs)). These do not mix with or dissolve in water to any great extent. Examples of hydrophilic molecules are water, salt, sugar, ethyl alcohol, ethylene glycol, glycerin, glucose, ammonia, most amino acids (e.g., glycine), some vitamins (B6, B12, Biotin, C, Niacin) and almost all inorganic compounds. All these molecules are much more soluble in water than in oil. Skimmers function by first generating a large amount of air/water interface. All commercial aquarium skimmers do this in the form of air bubbles suspended in water, though the line between air bubbles in water and water droplets in air is a fuzzy one in parts of some skimmers. Other configurations, such as the flat air/water interface on the top of an aquarium, are also suitable for the absorption of organic molecules. Organic molecules which are hydrophobic and those which are amphipathic collect at this interface, for reasons explained later (Figure 1). An oil scum seen floating on water is a perfect example of absorption at the air/water interface. Depending on the thickness of the oil layer, such layers can consist of a singly monomolecular layer, with one part of the organic molecule in the water and the other end facing the air. Thicker layers can also form, with some molecules facing the water, some purely in the oil phase, and some facing the air. So as newly created air bubbles are exposed to aquarium water, their surfaces collect organic molecules. There are, of course, organic molecules that are very polar and will neither be attracted to an air water interface, nor skimmed out, as detailed later in this article. Figure 1. A schematic diagram of air bubbles (white) in water (blue). Over time, the amphipathic organic molecules in the water (red) adsorb onto the air/water interface. As the bubbles in a skimmer start to come together (simply under the influence of gravity forcing them to the top of the collection chamber), they begin to interact and form a foam. Foams form when bubbles approach closely, and the water trapped between them is allowed to drain. The remaining foam consists of air pockets surrounded by a layer consisting of organic molecules near the air interface, then a thin layer of water, then another layer of organics attached to the air of the next air pocket. The more draining that takes place, the dryer the foam (meaning the thinner the water layer between organic-coated air pockets). This partially drained foam, which still contains some water along with the organic molecules, can then be collected and discarded. 1. A large amount of air/water interface must be generated. 2. Organic molecules must be allowed to collect at the air/water interface. 3. The bubbles forming this air/water interface must come together to form a foam. 4. The water in the foam must partially drain without the bubbles popping prematurely. 5. The drained foam must be separated from the bulk water and discarded. Anything that alters skimming efficiency must be impacting one of these factors. Subsequent sections of this article will explain each of these requirements in turn, and what things impact their efficiency. Why is a large amount of surface area required? This question goes to the root of why organic molecules absorb at this interface. The fundamental reason is that the interaction between two water molecules is much stronger than that between a water molecule and a hydrophobic organic molecule, such as oil. Water forms hydrogen bonds with other water molecules and certain other hydrophilic molecules, but not with oil. This interaction between water molecules is very strong, and has a large impact on water's properties. Thus, if an oil molecule is buried down inside water (i.e., dissolved), it is essentially "getting in the way" of water molecules that want to interact with each other. Squeezing the oil out of the water and onto the water's surface eliminates this interference, because the water molecules at the surface do not have anything above them to hydrogen bond with (air is no good for this, it is too "thin," meaning there is hardly anything there to interact with). This effect is called the "hydrophobic effect," even though it is really driven by hydrogen bonds in water, not by the hydrophobe at all. If the hydrophobe under discussion is oil, all of the squeezed-out oil molecules can ball up, forming a second phase of oil, as is observed when mixing olive oil and water. Concerning amphipathic molecules, however, their hydrophilic ends still want to interact with the water (because these ends can form hydrogen bonds or other types of strong interactions with water). Thus, the best that these molecules can do is squeeze their hydrophobic portions out of the water, leaving their hydrophilic portion in contact with the water. One place where they can do that effectively is at an air/water interface. In practice, most organic molecules found in seawater (and, in fact, most natural organic molecules) are amphipathic, with the bulk of the remaining molecules being hydrophilic. There are relatively few purely hydrophobic natural organic molecules. Most very hydrophilic molecules are not removed by a skimmer, so understanding how amphipathic molecules react in a skimmer is the key to understanding how a skimmer works. One reason that skimmers are often referred to as protein skimmers is that many proteins are amphipathic. They often have an interior made primarily of hydrophobic amino acids, and an exterior made primarily of hydrophilic ones. . When dissolved in water, only the hydrophilic exterior portions contact the water molecules. When placed in contact with an air/water interface (or something else that is hydrophobic), the proteins may alter their shape and present their hydrophobic portion to the interface. In this fashion they are readily attracted to an air/water interface. So what does all this mean for a skimmer? It means that only a monolayer of amphipathic molecules can form at the air/water interface. In other words, only a single layer of molecules can form at the air/water interface, with their hydrophilic tails in the water and their hydrophobic heads exposed to the air. Unfortunately for marine aquarists, a monolayer is very thin. A monolayer of soap comprises approximately 5 x 1014 molecules per square centimeter (cm2), which corresponds to about 0.0025 grams per square meter (g/m2). Removing 1 g of soap as a monolayer would require the generation of over 400 square meters (3500 square feet) of surface area. Certain factors can change this number significantly, but in general, this is why it's necessary to generate so much surface area. One way to think of this is to look at the surface area of a typical aquarium. The top of a typical 120-gallon aquarium has a surface area of only 0.7 square meters. A monolayer of organic molecules at this interface would weigh roughly 0.002 grams. Because a teaspoon of flake food may add a thousand times this amount, it's easy to see the need to generate large amounts of surface area. The name of the game in the evolution of commercial skimmers has been to develop improved ways to generate large amounts of air/water interfacial area. Any process that breaks up water and air into fine bubbles can work. In terms of bubbles in water, the smaller the bubble, the greater will be the surface area. In fact, for a sphere, the surface area goes as the square of the radius (S = 4*p*r2) while volume goes as the cube (V= (4/3)*p*r3). Consequently, one bubble that is 1 mm in diameter contains 0.52 cubic millimeters of gas and has a surface area of 3.1 square millimeters. Alternatively, if we have 1,000 bubbles one tenth that size (0.1 mm), then the volume of gas is still 0.52 cubic millimeters, but the surface area is now 31 square millimeters, or tenfold. In practice, a lower limit to bubble size is reached in skimmers where making the bubbles smaller precludes them from rising to the water surface to be collected. This is readily apparent in a marine aquarium. Swishing an object through the water will result in some large bubbles that rapidly rise, and some smaller ones that are much slower to rise. A small enough bubble may take hours to rise to the top of a collection unit. An analogy is dust in the wind. Big objects (rocks) quickly drop out of air, but fine dust may stay suspended for days. Designing a skimmer is thus a trade-off between bubble size and collection time. The only other way to win the game is to generate larger numbers of bubbles. As an academic consideration, it is not essential to generate the interface as bubbles in water. Drops of water in air (which may, in fact, occur in portions of some skimmer designs), or even a rapidly turned over flat surface could be just as effective. For practical reasons, mostly relating to gathering and removing the collected organics, the air bubbles in water design seems to work best. 1. Why does skimming work better in saltwater than in freshwater? There are two fundamental reasons that skimming is more effective in seawater than in freshwater. One is the reduced solubility of organics, especially hydrophobic ones. Because many organics are less soluble in saltwater than in fresh, they are more easily squeezed out of it to an air/water interface, and collected as foam. This is the basis for the well-known salting-out effect of proteins. Quoting from a basic biochemistry text: "At sufficiently high ionic strength a protein may be almost completely precipitated from solution, an effect called salting-out." A second reason for less efficient skimming of freshwater relates to bubble formation and coalescence. It turns out that air bubbled into seawater forms smaller bubbles than if the same device bubbled into freshwater.1-4 The possible reasons for this have been discussed in the scientific literature, but the exact reason is not universally agreed upon. Despite the fact that skimmers usually produce larger bubbles in freshwater, and that organics are often more soluble in freshwater, it is not impossible to skim freshwater. Rivers from certain areas of the northeastern United States sometimes have foam on them, which comes from tree sap and other natural organics that enter the water. They have a low solubility in water, and are easily collected as foam in a natural skimming action. Few, if any, natural inorganic molecules will absorb at an air/water interface on their own. Nearly all inorganics in seawater are highly polar, charged ions, which actually will be slightly repelled from the interface for the same reason that hydrophobes are attracted to it. These inorganics interact even more strongly with water than water does with itself. Thus, to expose these at the water's surface would create an unstable situation from which they would quickly move back into the bulk water. Many inorganic materials, however, are complexed to organics that are skimmed out. Copper in seawater, for example, is more than 99% complexed to organics such as humic acids and proteins (Figure 2). 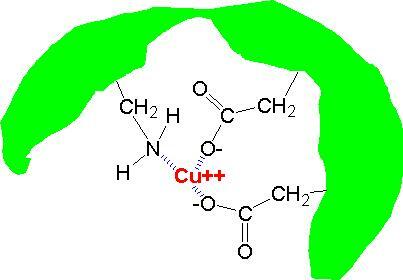 If those organics are adsorbed onto the air/water interface, then the copper will be as well. Analyses of skimmate are fairly limited in scope and the one published study shows high variability from sample to sample. This study, however, does seem to show elevated levels of copper (as well as iron and other trace metals) relative to ions not selectively skimmed out (say, magnesium or sodium). Inorganic ions will also be skimmed if they are contained inside a microorganism (diatom, bacterium, alga, etc.) that has a partially hydrophobic exterior (many do) and is skimmed out. Such whole organisms may be skimmed out by getting caught at the air water interface, just as individual organic molecules are. They may also get trapped in the foam as it drains. The skimming of whole organisms is evident to many aquarists who observe green coloration to skimmate after dosing phytoplankton, for example. The green colored organisms can collect in skimmate. Many aquarists believe that iodide is readily skimmed out. I do not believe that to be true. It is unlikely that iodine, in any natural inorganic form present in seawater (iodide or iodate), will be appreciably removed by skimming. These forms will not be attracted to an air/water interface, nor are they especially strongly bound to organics. However, many organic compounds that contain iodine will be skimmed out (as well as possibly evaporated into the air). The conversion of the various forms of iodine to iodoorganic compounds is one way that iodine is removed from the water column of marine aquaria (another being by uptake into organisms such as algae), and skimming may enhance this export rate by intercepting compounds before bacteria can break them down again, releasing iodine. The removal of whole microorganisms (bacteria, algae, etc.) is another way that iodine can be removed by skimming. Analyses of skimmate, as mentioned above, are fairly limited in scope, but one published study shows substantial elevation (several hundred-fold) in total iodine relative to ions not selectively skimmed out (say, magnesium or sodium) when compared to the ratio of the same ions in seawater or reef aquarium water. In general, nitrite, nitrate and phosphate will not be directly skimmed out of seawater because they do not adsorb onto air water interfaces. Nitrogen and phosphorus are, however, readily removed as parts of organic molecules that are skimmed out. Analyses of skimmate, as mentioned above, are fairly limited in scope, but one published study shows a substantial elevation in total phosphorus (on the order of a thousand-fold) and total nitrogen (on the order of a hundred-fold) relative to ions not selectively skimmed out (say, magnesium or sodium) when compared to the ratio of the same ions in seawater or reef aquarium water. Hence, skimming may effectively lower the concentrations of nitrate and phosphate that may otherwise build up in an aquarium, by exporting the organics that are often precursors to some portion of the nitrate and phosphate present in aquarium water. Phosphate also may be incorporated into certain inorganic particulates, such as calcium carbonate (CaCO3), which could be skimmed if they were coated with organics. Of course, calcium and possibly magnesium in these particulates are also removed. Ammonia might be blown off into the air in a skimmer because it is always in equilibrium with atmospheric ammonia gas, and strong aeration will eliminate some of it. Many of the ions that aquarists are most concerned with are not appreciably impacted by skimming because they do not adsorb onto an air water interface, and are not primarily bound to organics. These include calcium, magnesium, strontium, bicarbonate and carbonate (alkalinity) and silicate. In addition, none of the other major seawater ions will be impacted by skimming, including chloride, sodium, sulfate, fluoride, bromide (except as organobromine compounds), borate and potassium. 3. What else is removed? Nearly any hydrophobic or amphipathic molecule can be skimmed out to some extent. This list includes amino acids, vitamins, proteins, carbohydrates, fats, many combination biomolecules (e.g., lipoproteins, liposaccharides), RNA, DNA, etc. This list includes most, but certainly not all, organics. Fortunately, it includes many of the organic compounds that lead to yellowing in marine and reef aquaria, so skimming can help reduce the yellowing of aquarium water. I also would expect that many toxins and slimes produced by a tank's organisms are removed to varying degrees by skimming, based on the fact that many are amphipathic. Some would be expected to be readily removed, and others more slowly based on their hydrophilicity and hydrophobicity. Figure 3 shows domoic acid, a toxin produced by diatoms. The fact that it has hydrophobic portions (red) and hydrophilic portions (green) suggests that it may be readily removed by skimming. Figure 3. Domoic acid, a toxin produced by diatoms. Hydrophobic portions are shown in red and hydrophilic portions are shown in green. Because it has both regions, it is amphipathic and would be removed by skimming. Particulate organics also may be removed, as they often are amphipathic. The removal of microorganisms by skimming was mentioned previously. The export of microorganisms might have positive effects in the sense of nutrient export from the aquarium. A potential reduction of undesirably high levels of bacteria, pathogens and dissolved algae might also be a benefit. On the other hand, skimming almost certainly removes many micro- and even macroorganisms from the water column that might otherwise become food for a tank's inhabitants (as well as the organic molecules that might be food - like proteins). It is not clear how large an impact this has, but it certainly depends upon the type of inhabitant that is being considered and the skimmer's efficiency. 4. What organics are not removed? Most highly polar organics will not be removed by skimming. Simple sugars, acetate, oxalate, methyl alcohol, choline, citrate, etc. will remain behind. They simply are not sufficiently attracted to an air water interface. Most charged species are, in fact, repelled from the air/water interface, so they are not collected. Fortunately, many of these highly polar organic materials are readily metabolized by bacteria and other organisms, so they do not continually build up in marine aquaria. Once a skimmer has generated a large amount of surface area, the next process involves allowing organics to actually diffuse to the interface. How long does this take? That's an important question without a perfect answer. Diffusion of molecules in water can be slow. For very large molecules, such as proteins and carbohydrates, it can be very slow. It might take hours for a protein to diffuse a few inches in water. Fortunately, we do not need to rely purely on random diffusion to carry organics to the surface. Nearly all skimmers have bubbles in a turbulent environment, where they can be carried around by water flow as well as by diffusion. As the organics approach the bubble's surface, however, water movement relative to the bubble will be greatly reduced, and diffusion will be necessary for the final travel to the interface. The amount of time necessary for complete accumulation of organics at the surface also depends upon the concentrations of organics in the water and even on the chemical nature of the organics present. It makes perfect sense that in water with high levels of organics, the interfacial area will be rapidly occupied by organics. That is because there are enough in the local area around the bubble to saturate the interface. When the concentrations are lower, organics have to diffuse from farther and farther away from the bubble to saturate it. Additionally, different organics have different binding strengths to the air/water interface. Compounds which bind more strongly will slowly replace those already at the interface which have weaker binding. Thus, a bubble which is completely occupied with organics might still be changing with time upon further exposure to aquarium water. It will not, however, go on increasing its organic load indefinitely. For these various reasons, there's no certain amount of time that is necessary for organics to fully saturate bubbles. Further, it is incorrect to claim that it is always better to increase the contact time between bubbles and the aquarium water. Likewise, the way the bubbles move relative to the water is important. If the bubbles are moving against the water's flow, or are in a turbulent environment, the required absorption time will be lower (because the flow helps bring organics to the interface) than if the bubbles are moving with the flow. Once a skimmer contains a large number of bubbles coated with organics, it is necessary to somehow remove the bubble surfaces, but not the majority of the water nearby. This is most easily accomplished by allowing the bubbles to form a foam. Foam formation takes place when bubbles accumulate and interact. The froth of bubbles begins to drain under gravity, removing much of the water between the bubbles. Some of the bubbles merge into larger bubbles. As long as the bubbles do not pop before significant draining occurs, then the organics will be left behind in the foam, along with some residual water. Eventually, the concentration of organics on the top of the foam becomes great enough that they exceed the solubility limit, and small particulates of organics form. These particulates are generally what a skimmer collects, along with some water and organics that remain present in solution or at the air/water interface. Foam draining is a critical stage for most skimmers. One problem with drainage is that some organics are washed away with the draining water. There is always an equilibrium between organics in solution, and those actually attached to the interface. As water continues to drain, some of the organics are lost. Further, as some bubbles pop and their organics are redistributed into the nearby water, the local concentration of organics in the water between the bubbles in the foam can rise to concentrations far higher than are present in the aquarium. For this reason, the most effective skimming, in terms of total organic removal, comes from removing somewhat wet foam, rather than waiting for this same wet foam to drain prior to removal. The primary difference between wet foam, and drained dry foam, is that additional water and some organics have drained away. A dry form is more efficient in terms of the amount of organic removed in relation to the water volume, and all skimmers and their potential adjustments strike some balance between removing more water and slightly more organics, or less water and slightly fewer organics. Perhaps a careful analysis of different types of skimming will, in the future, show this expected result experimentally. Other critical things can occur at the foam draining stage, and they usually impact skimming negatively. One is the addition of materials that cause bubbles to pop prematurely. Excessive oils, for example, cause this to happen. When typical oil droplets are added to a reef aquarium, they quickly arrive at the skimmer. A pure oil droplet is largely hydrophobic on all sides. Oil drops work their devilish tricks in skimmers by spanning across the water between two air bubbles in a foam (Figure 4). Once an oil droplet spans the water gap between bubbles, the amphipathic molecules on both of the bubbles' surfaces spread along the interface between the oil and the water (if they were not there already) and connect both of the air gaps with a continuous line of amphipathic molecules along this oil/water interface. Once these amphipathic molecules are in place, the interaction is unstable. 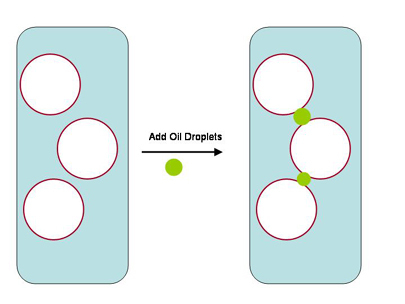 The surface tension pulls at the oil drop (Figure 5), and it simply comes apart. The bubble ruptures from the site of the oil drop, and the effect is that the bubbles combine, or pop entirely. The reason that this does not happen in the absence of an oil drop is that to cause a rupture requires the water present between the air bubbles (or between a single bubble and the nearby atmosphere) to become exposed as fresh air/water interface. In fact, it requires a continuous line of water molecules to become exposed all at once. Figure 4. 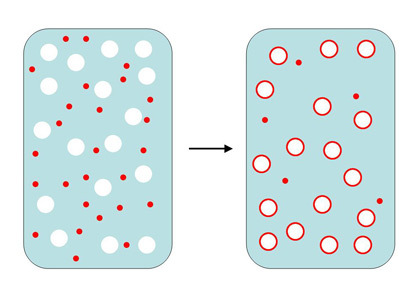 A diagram showing oil droplets (green) adhering to the surface of air bubbles (white) in water (blue) coated by organics (red). This adherence is the first step in bubble popping and foam collapse caused by oil in a skimmer. Figure 5. The sequence of events leading to foam collapse caused by oil in a skimmer . 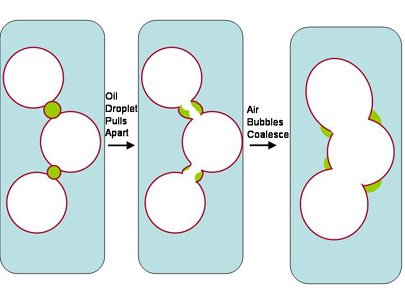 Oil droplets adsorbed onto air bubbles (Figure 4) first allow amphipathic organics to cover their surfaces and span the water gap between air bubbles. They then pull apart internally, allowing the collapse of individual bubbles. Because such a rupture would require a large number of hydrogen bonds to be broken simultaneously, it simply requires too much energy to actually take place. When the oil drop is there, the water molecules are no longer exposed, but rather the oil or amphipathic molecules, which are much "happier" to be exposed to air, and the droplet ruptures, breaking the bubbles on either side of it into one larger bubble. That process continues until no foam remains. Bubble popping can also be caused by hydrophobic solids, although that process is likely less important to aquarists than is popping due to oils. The effects of this bubble popping process, if not the mechanistic details, are easily observed in an aquarium, where many things may cause a bubble popping effect. One cause that most aquarists encounter is oil from their hands. After reaching into a saltwater aquarium, skimming action often comes nearly to a halt as bubble popping dominates foam drainage and collection. The popping will proceed until the oil is somehow removed. Among other ways, oil can be removed by splattering it above the foam height in the skimmer, being foamed out bit by bit, being emulsified into the general foam as very, very tiny droplets which no longer span air bubbles, becoming attached to solid objects and removed, being consumed by tank microorganisms and by eventually dissolving into the bulk tank water. Many foods used by aquarists have a similar effect on skimmer bubbles. As an aside, the bubble popping action of hydrophobic oils is exactly how most anti-gas medications for humans function. Simethicone is really polydimethylsiloxane, which is a hydrophobic polymer liquid. It pops bubbles in your stomach or intestine, and permits the gas to be eliminated. Antifoaming agents also are the basis for a large number of industrial products that work on the same principle. Other things also cause bubble popping. One of these is the fatty acid supplement Selcon. It causes bubble popping in the same fashion as skin oil droplets. Hydrophobic solid objects can also cause popping. Fine particles of activated carbon, sand, inorganic precipitates, or granular ferric oxide/hydroxide, once coated by organic compounds, can serve to break foams in a manner analogous to the described for liquid oils. After a foam has drained to the desired extent, it must be collected and removed from the system. Most skimmers perform this by simply permitting the foam to be created at a rate that pushes the drained foam over a certain threshold, where it is irreversibly collected and discarded. This process is straightforward, and is mostly an engineering issue, as opposed to a chemical issue. The tricky thing for efficiency is to balance foam creation, drainage and collection. Ozone's effects on skimming seem to vary, but most people (including me) using modern skimmers observe less skimmate collection when using ozone than when they don't. As I detailed in a previous article, ozone tends to break organics down into smaller, more hydrophilic pieces, and such pieces often are more readily biodegraded than larger pieces. Therefore, the ozone may need only to start the degradation process, and bacteria in the aquarium can finish off the organics by uptake and metabolism. Large humic acid molecules, for example, are converted by ozonation into smaller fragments that are more readily taken-up and metabolized. Skimming is a complex process with many subtleties, as discussed in previous sections. Years ago it was widely claimed that ozone use increased skimming, and I claimed then that I didn't see how that could happen directly. Most organic compounds likely to be found in significant quantities in a reef aquarium will become more polar and likely less able to be skimmed after reacting with ozone. 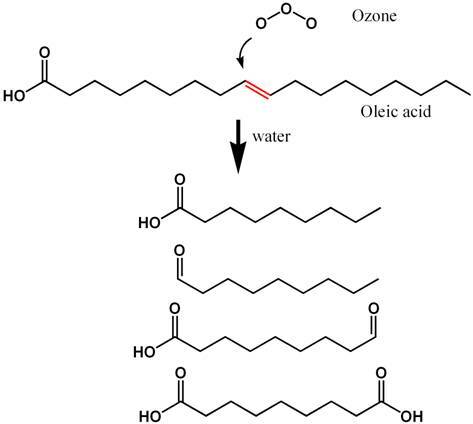 Figure 6, for example, shows how the fatty acid oleic acid (readily skimmed) reacts with ozone to produce more polar compounds that will not be so readily skimmed because they will not be as strongly attracted to an air water interface. Figure 7 shows a similar sequence for phenol, which is typical of the larger humic and fulvic acids present in seawater that cause yellowing. Again, the reaction products after ozonation are generally more polar and less able to be skimmed than the starting organic compounds. Figure 6. The reaction known to take place when ozone reacts with oleic acid (a dietary fatty acid) in seawater. Hydrogen atoms are not shown (for clarity), and each intersection of lines comprises a carbon atom. The carbon-carbon double bond (C=C) that reacts most readily with ozone is shown in red. The products that result from reaction with ozone in seawater are shown at the bottom. These resulting compounds are less strongly adsorbed onto air/water interfaces, and so are less effectively removed by skimming. Figure 7. 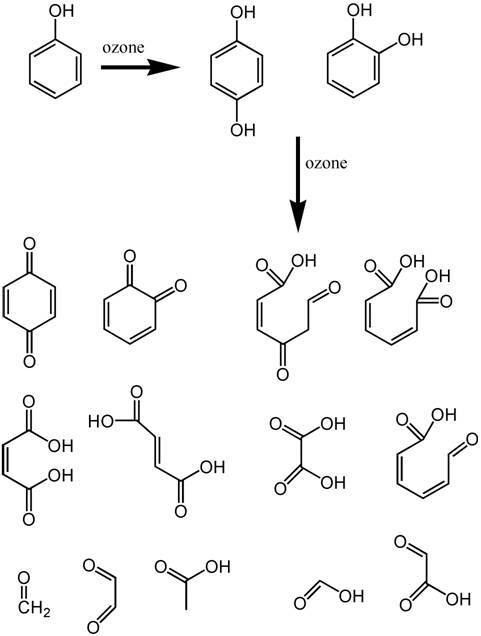 The reaction products of phenol (top left) when exposed to ozone. Hydrogen atoms are not shown (for clarity), and each intersection of lines comprises a carbon atom. 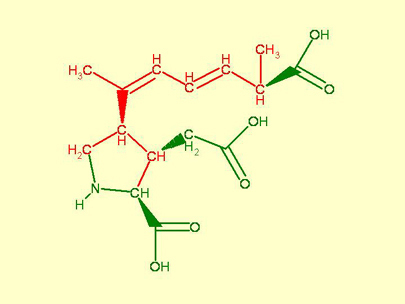 The phenol molecule serves as a surrogate for the more complicated structures in humic and fulvic acids that cause much of the natural yellowing of aquarium water. These resulting compounds are less strongly adsorbed onto air/water interfaces, and so are less effectively removed by skimming. A small portion of organic molecules in reef aquarium water may become more skimmable if, for example, they become more hydrophobic after reacting with ozone. They also may become more skimmable if they were totally hydrophobic before ozone and were transformed into molecules with polar (hydrophilic) and nonpolar (hydrophobic) parts (amphiphilic), which more readily adsorb onto an air water interface and are skimmed out. Are there other ways that skimming might be increased by ozone besides these two processes? I hypothesized in a previous article that such an increase may be due to increased growth of bacteria (either in the water itself or bound to surfaces), and possibly also to the release of new organic molecules as they grew, that caused the improved skimming that some aquarists observed. It seems as if the tide of opinion has turned, however, and most aquarists now claim that the amount of skimmate is reduced significantly when using ozone. Many claim that the collection of skimmate has nearly stopped in their aquaria when starting ozone. Why the difference compared to past opinion? That's hard to say, and may depend on the types and qualities of the skimmers available now compared to years ago, as well as changes in other husbandry practices. In any case, the overriding experience of many aquarists today is that skimming is reduced, and the presumed reason is that the organics are being made chemically less skimmable by ozone. The remaining organics would then be removed more by bacterial processes than before the initiation of ozone in the same aquarium. One of the biggest positive effects of skimmers is that they are, in general, great ways to aerate the water. The fresh air/water surface area provides a good place for gas exchange. While nearly all aquarists with reef aquaria believe that their water is well-aerated by the turbulent flow that they have, the reality is often not so positive. Both oxygen and carbon dioxide are consumed and produced in aquaria in large amounts, and the balance can easily tip toward undesirably low oxygen levels, or unacceptable pH (due to high or low carbon dioxide levels). Using an oxygen meter, Eric Borneman showed that the oxygen levels in a clownfish aquarium were kept substantially higher, especially at night, than in the same aquarium without a skimmer. In the absence of an oxygen meter, the effects of incomplete aeration are most readily observed via pH. Excessive carbon dioxide builds up at night in many reef aquaria, lowering pH. Likewise, the effects of photosynthesis and sometimes the use of high pH additives such as limewater deplete carbon dioxide, raising the pH. Given perfect aeration with normal air, the pH in seawater does not change through the course of a day. However, most aquarists see higher pH at the end of the light cycle than at the beginning, and this effect is because of incomplete aeration. Without the extra aeration provided by the skimmer, not enough carbon dioxide could be drawn into my system. Even if this aeration were the only useful effect of skimming, it would be worth it for my system. A question often asked by aquarists when skimming their reef aquaria is whether they need to supplement anything that is being exported by skimming. The same question applies to the use of activated carbon. Few data are available on the bioavailability of certain trace metals in marine aquaria. Elements such as copper, for example, may be elevated above natural levels due to food additions (as in my aquarium) but be bound to organic matter in a way that reduces its availability to organisms. Whether reef aquaria in general benefit from additions of these metals, regardless of skimming, is unclear. Reef aquaria may benefit from the lowered levels of certain metals due to skimming, and adding them back may be counterproductive. In general, my recommendation is not to dose trace elements with just one exception: iron. Many aquarists that grow macroalgae find better growth, and more growth of macroalgae relative to microalgae, when dosing iron. Whether skimming increases the need for iron dosing isn't clear, but it might. Skimming does not alter the clear need to supplement calcium and alkalinity for all reef aquaria, nor the need to dose magnesium if it becomes too low. Skimming also does not create any need to dose iodine, although it may export organoiodine forms from the system. Iodine supplementation is not needed because it does not have a demonstrated benefit to most organisms kept in marine aquaria, and because some comes in with all feedings of marine-based foods. Nor does skimming create a need for supplemental strontium, both because strontium is not strongly bound to organics, and because it does not seem to be a useful or necessary additive under most circumstances. I summarize my dosing recommendations for reef aquaria in general in this article, and I do not believe that skimming significantly alters the standard recommendation. Skimming can impact salinity, depending on how the skimmate is replaced. Most aquarists find that skimmate's salinity is similar to that of the aquarium. Some find it slightly more saline, and some slightly less, probably due to the likelihood of water evaporating or condensating out of, or into, the skimmate before it is measured. For those who are interested, skimmate's salinity is best measured by conductivity, as refractometry and even specific gravity may be impacted by the high level of organic materials. Skimming's primary effect on salinity arises from how the skimmate is replaced. If it is replaced with freshwater, as with an auto top-off system, the salinity will slowly decline. If it is replaced by new saltwater of an equal volume, the effect on salinity will be minimal. Wet skimming and replacement with new saltwater is a good way to do water changes, in fact. The advent of high quality skimmers has gone a long way to reduce the quantity of dissolved organic matter in marine aquaria. Skimmers can increase the water's aeration, potentially helping to maintain adequate oxygen levels at night and keeping the pH from getting too high or low due to incomplete carbon dioxide equilibration. The removal of organic compounds likely has beneficial effects such as removing toxins, reducing yellowing of the water, and reducing precursors to nutrients that may drive algal growth. Such organic removal may also be detrimental, for example, by removing foods for certain organisms. On balance, I believe that skimming is a strong benefit to typical reef aquaria, but each aquarist may need to decide that for themselves, and further data in the future on the exact organics removed and what effects that removal has may tip the balance one way or the other. Hopefully, this article will help hobbyists understand how skimming works, and then allow them to use that information to critically evaluate claims about what skimmers can and cannot do, and how best to use them. 1. Bubble shattering: differences in bubble formation in freshwater and seawater. Slauenwhite, David E.; Johnson, Bruce D. Department of Oceanography, Dalhousie University, Halifax, NS, Can. Journal of Geophysical Research, [Oceans] (1999), 104(C2), 3265-3275. 2. Bubble-size distributions produced by wall injection of air into flowing freshwater, saltwater and surfactant solutions. Winkel, Eric S.; Ceccio, Steven L.; Dowling, David R.; Perlin, Marc. Mechanical Engineering, University of Michigan, Ann Arbor, MI, USA. Experiments in Fluids (2004), 37(6), 802-810. 3. Laboratory air bubble generation of various size distributions. Puleo, Jack A.; Johnson, Rex V.; Kooney, Tim N. Marine Geosciences Division, Naval Research Laboratory, Stennis Space Center, MS, USA. Review of Scientific Instruments (2004), 75(11), 4558-4563. 4. Bubble size in aerated stirred tanks. Alves, S. S.; Maia, C. I.; Vasconcelos, J. M. T.; Serralheiro, A. J. Department of Chemical Engineering, Centro de Engineering Biologica e Quimica, Instituto Superior Tecnico, Lisbon, Port. Chemical Engineering Journal (Amsterdam, Netherlands) (2002), 89(1-3), 109-117. Removal of total suspended solids by a foam fractionator in a simulated seawater aquaculture system. Peng, Lei; Jo, Jae-Yoon. Department of Aquaculture, College of Fisheries Science, Pukyong National University, Nam-gu, Busan, S. Korea. Han'guk Yangsik Hakhoechi (2003), 16(4), 216-222. Publisher: Korean Aquaculture Society. Research advances in treatment technology of effluent from aquaculture. Liu, Changfa; Yan, Zaisheng; Zhang, Junxin; He, Jie; Xi, Hongjun. Key Laboratory of Mariculture and Biotechnology, Agriculture Ministry, Dalian Fisheries University, Dalian, Liaoning Province, Peop. Rep. China. Dalian Shuichan Xueyuan Xuebao (2005), 20(2), 142-148. Publisher: Dalian Shuichan Xueyuan Xuebao Bianjibu. Performance of a lab-scale closed seawater recirculating system for Korean rockfish Sebastes schlegeli culture. Peng, Lei; Oh, Sung-Yong; Jo, Jae-Yoon. Department of Aquaculture, College of Fisheries Science, Pukyong National University, Pusan, S. Korea. Ocean and Polar Research (2003), 25(4), 493-501. Publisher: Korea Ocean Research and Development Institute. Treatment of aquacultural recirculating water by foam separation. I. Characteristics of protein separation. Suh, Kuen-Hack; Lee, Min-Gyu. Dep. Chem. Eng., Natl. Fisheries Univ. Pusan, Pusan, S. Korea. Han'guk Susan Hakhoechi (1995), 28(5), 599-606. Publisher: Korean Fisheries Society. Treatment of aquaculture recirculating water by foam separation - II. Characteristics of solid removal. Suh, Kuen-Hack; Lee, Min-Gyu; Lee, Min-Soo; Kim, Byong-Jin; Kim, Eun-Jung; Cho, Moon-Chul. Department of Chemical Engineering, Pukyong National University, Pusan, S. Korea. Han'guk Susan Hakhoechi (1997), 30(3), 334-339. Publisher: Korean Fisheries Society. Characteristics of proteins and total suspended solids removal by counter current air driven type, high speed aeration type and venturi type foam separator in aquaculture water. Suh, Kuen-Hack; Kim, Byong-Jin; Kim, Sung-Koo. Department of Chemical Engineering, Pukyong National University, Pusan, S. Korea. Han'guk Susan Hakhoechi (2000), 33(3), 205-212. Publisher: Korean Fisheries Society. Protein removal by a foam fractionator in a simulated seawater aquaculture system. Peng, Lei; Oh, Sung-Yong; Jo, Jae-Yoon. Department of Aquaculture, College of Fisheries Science, Pukyong National University, Pusan, S. Korea. Ocean and Polar Research (2003), 25(3), 269-275. Publisher: Korean Ocean Research and Development Institute. Method for raw water pretreatment for removing turbid suspensions by using ozone. Sawada, Hidetaka; Nagao, Shuji; Shiota, Masahiro. (Hitachi Shipbuilding and Engineering Co., Ltd., Japan). Jpn. Kokai Tokkyo Koho (2001), 6 pp. Theory and application of foam fractionation. Bikerman, J. J. USA. Tr. - Mezhdunar. Kongr. Poverkhn.-Akt. Veshchestvam, 7th (1978), Meeting Date 1976, 323-31. Publisher: Nats. Kom. SSSR Poverkhn.-Akt. Veshchestvam, Moscow, USSR. Foam and bubble fractionation for removal of trace metal ions from water. Valdes-Krieg, Ernesto; King, C. Judson; Sephton, Hugo, H. Sea Water Convers. Lab., Univ. California, Berkeley, CA, USA. Editor(s): Sabadell, J. E. Traces Heavy Met. Water Removal Processes Monit., Proc. Symp. (1973), 189-210.